“I’ve always said Portuguese food suffers from poor marketing,” says David Leite, memoirist, cook, and author of The New Portuguese Table, as he sits across from me drinking a café au lait. 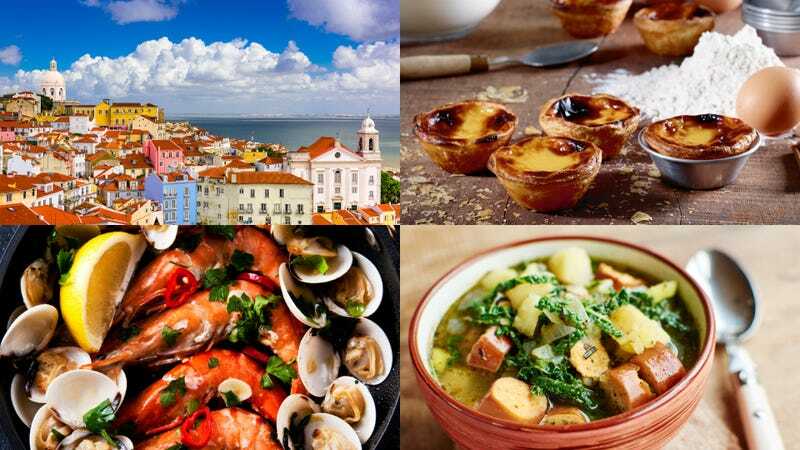 We’ve been discussing the incredible bounty of Portuguese cuisine and why, unlike its neighbor Spain, people don’t rampantly evangelize both the country and its food. According to George Mendes, owner and head chef of the Michelin-starred New York City restaurant Aldea, the core ingredients of the cuisine are “olive oil, salt cod, pork, garlic, and parsley.” Leite says potatoes, chouriço, and linguiça sausages, and chicken are also ubiquitous. The ingredient people are most likely to be immediately familiar with is bacalhau—salt cod. According to Leite, cod was salted on fishing vessels in order to preserve it for the long trip back to shore, but also because “it becomes firmer, and the same way when you brine a piece of meat it also has more flavor.” Leite says salt cod produced today is less intensely salted than it used to be, as preservation is now less of an issue and salting is now done more for flavor and texture. When asked separately what they feel is one of the most essential dishes in the food canon of Portugal, both Leite and Mendes respond with bacalhau à Gomes de sá, a casserole made with layers of potato, salt cod, and refogado, a type of sofrito made with olive oil, onions, garlic, and laurel bay leaves. The casserole is browned and topped with sliced hardboiled eggs, black olives, and more olive oil. Perhaps one of the most famous Portuguese dishes these days though is peri-peri chicken, a dish originating in Africa and resulting from the Portugal’s history as a nation of seafaring traders, explorers, and missionaries. Whole chickens are spatchcocked, brushed with peri-peri sauce (which Leite describes as a hot pepper sauce similar to Tabasco), grilled, and served with french fries. Pastries in Portugal are also an area where the influence of both trade and religion are evident. Leite describes pastel de nata as being “the queen of Portuguese desserts”. These small, cupped pastries are made of flaky dough and filled with a sweet egg custard flavored with vanilla and cinnamon (both colonial imports) and cooked in blazing ovens until glossy and sporting dark spots of caramelization. The original version of this dish is attributed to the monks of Mosteiro Dos Jerónimos, a monastery located in a parish of Lisbon called Belém. After an edict forced the closure of the monastery in 1837, the monks opened a bakery mere blocks away from their former home, which they called Antiga Confeitaria De Belém. While the pastries are popular just about anywhere the Portuguese have settled, this bakery, which is still very much operational, is said to pump out more than 10,000 pastries a day, a good indication of how revered they are. Ultimately, continental Portuguese cuisine is about highlighting natural flavors and making good use out of the country’s proximity to the sea and its rich terroir. Jacob Dean is a freelance food and travel writer based in New York. He holds a doctorate in psychology and likes beer, less traveled airports, and is allergic to grasshopper tacos.